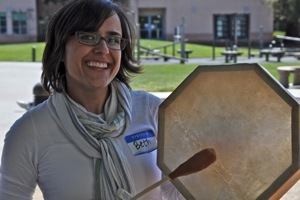 About a dozen Vets living at the Menlo Park VA are now drum makers, thanks to a program put together by Beth Longwell (pictured below), a music therapist at the facility, in partnership with The Riekes Center. Today they worked on the final piece of their new instruments, the mallets, before participating in a drumming circle. 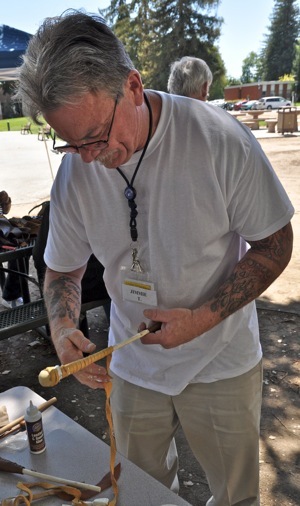 Most of the Vets had never made a drum before, but embraced the activity. “I signed up because I thought it would be a good way to meet new people, so something crafty and learn how to drum,” said Kim (pictured top), who spent four years in Germany and two in Panama with the U.S. Army. The drums and tops of the mallets are made with deer, goat, cow and moose hide. Sewing the tips of the mallets took a fair degree of effort with some vets using thimbles and others using pieces of hide to help propel the needle and thread. What a wonderful story — love the idea of music for therapy. Way to go VA and thank you Linda for the great article. I was interested in drum making. Could you tell me when you are having another drum making class. I live in Hayward. Menlo Park is not far from me. I’ve been looking for a class like this. Beth, this is AWESOME! What great work you are going!